I've decided to start documenting my cupcakes. It's going to be my portfolio for when I start my cupcake business (everyone needs a backup plan). 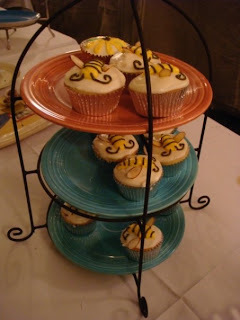 These are some of the cupcakes I made for my friend Anna Alter's wedding. It was an outside, country-ish wedding which is why we went for the bee and flower theme.